Designed for mid-sized or smaller hospitals, nursing homes and healthcare clinics, RajaHamsa is an end-to-end information management system that enables efficient management of administrative, financial, and clinical aspects of a healthcare center. It simplifies and automates various tasks for managing patient data, right from registration till final billing. Although lightweight, Rajahamsa is a comprehensive HIS with all the requisite modules such as Admin, Billing, Reports, MIS, Diagnostics etc, thereby creating a single solution for all needs. RajaHamsa is a light waited Hospital Management Information System and can be easily qualified as a Clinic Management System/Clinic Management Software. RajaHamsa comes in two variants namely Lite and Advanced. 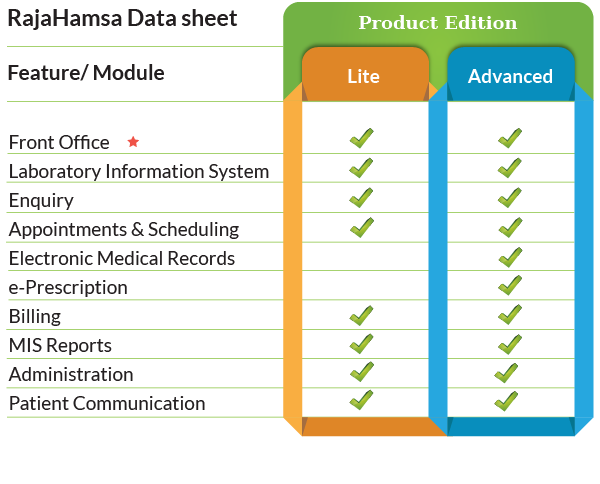 RajaHamsa Lite is essentially suitable for a single doctor clinic and Advanced variant is suitable for polyclinics and Nursing Homes. The below table provides a complete data sheet of RajaHamsa features. limited to the type of data collected in the corresponding units, Includes all the basic functions related to OPD, IPD, and walk-ins that are to be handled by the front office like Registration of patients, Ordering Services, managing appointments, etc.